The end of the tarsealed part of Woodland Rd. 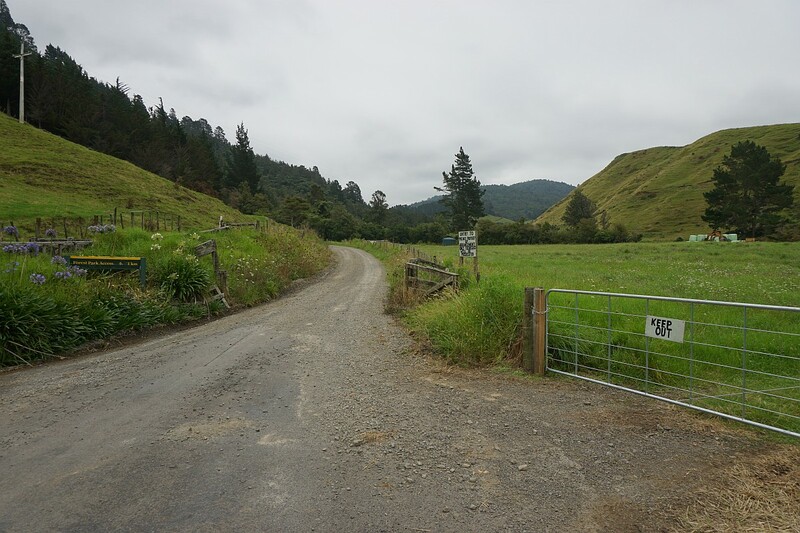 The narrow gravel road continues on straight ahead through the open gateway for about 1 km to the parking area. The parking area at the end of Woodland Rd. 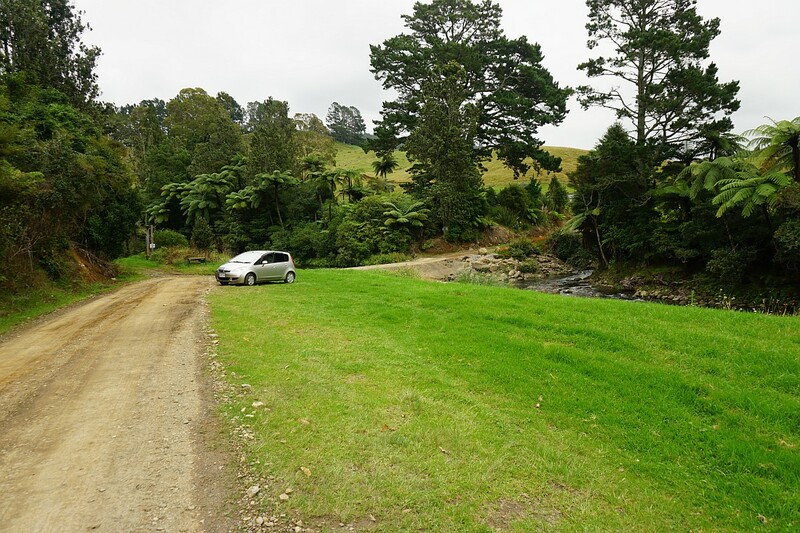 The track to Ananui Falls starts to the left of the car. The concrete bridge to the right of the car leads to private farmland. The start of the track runs alongside the stream after crossing a stile, just left of centre. 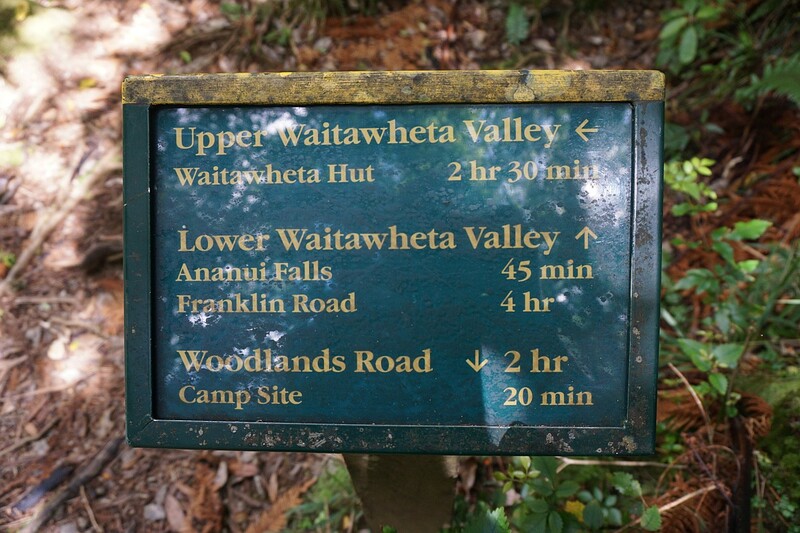 The stile, with the sign indicating a 2 hour 30 minute walking time to the Ananui Falls. 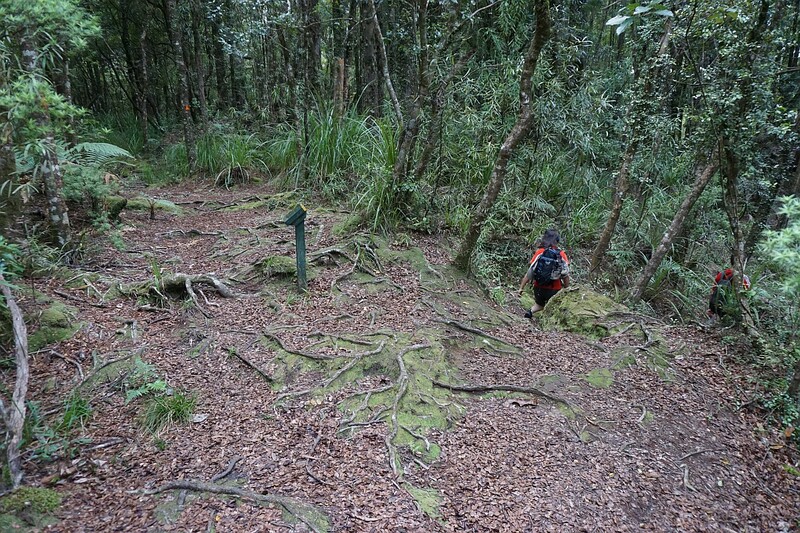 The first few hundred metres of track after crossing the stile runs alongside the Wairoa/Waitengaue Stream. 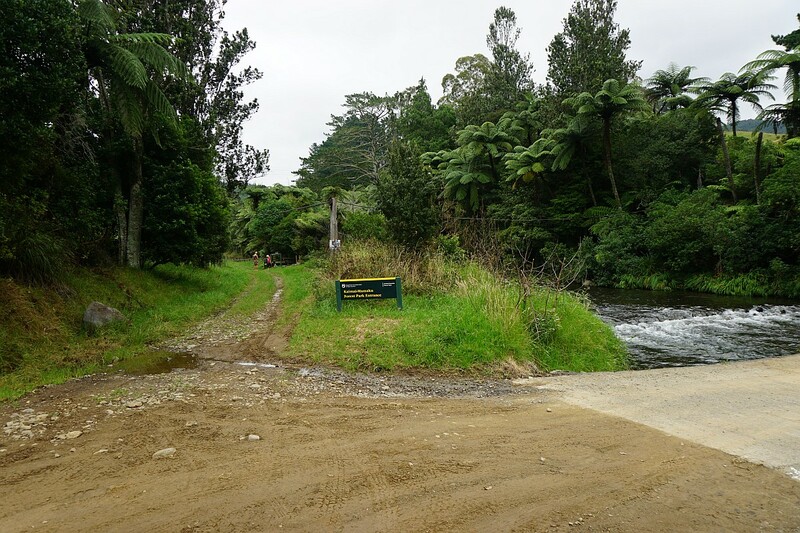 The first crossing is the Wairoa Stream, where there was a swingbridge until recently. The poles and signs from the swingbridge are still in place, but the bridge itself has been removed. 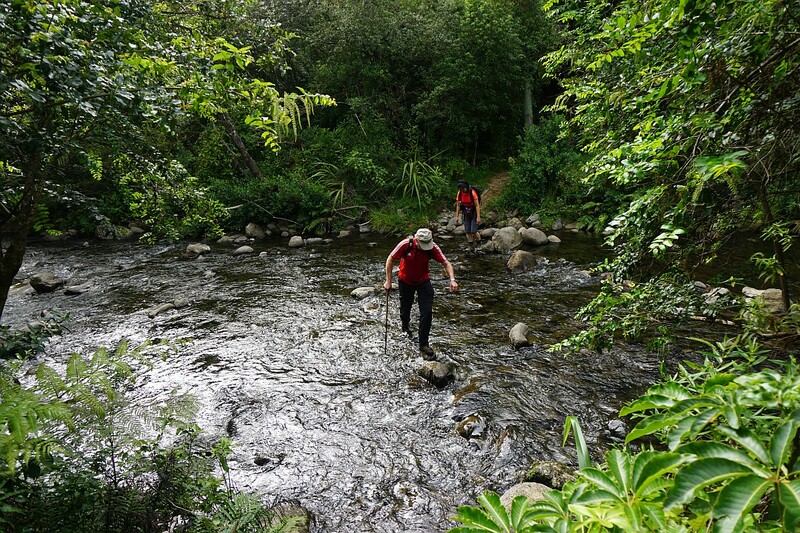 The stream can be too deep to cross without getting wet feet, but on this occasion it was just possible to cross by stepping on rocks, some of which are very slippery. 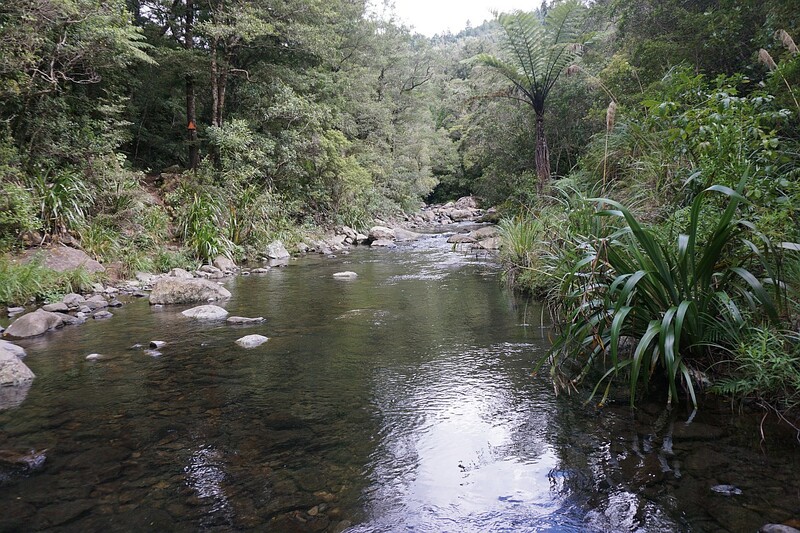 The Wairoa Track branches off to the left immediately after the Wairoa Stream crossing. 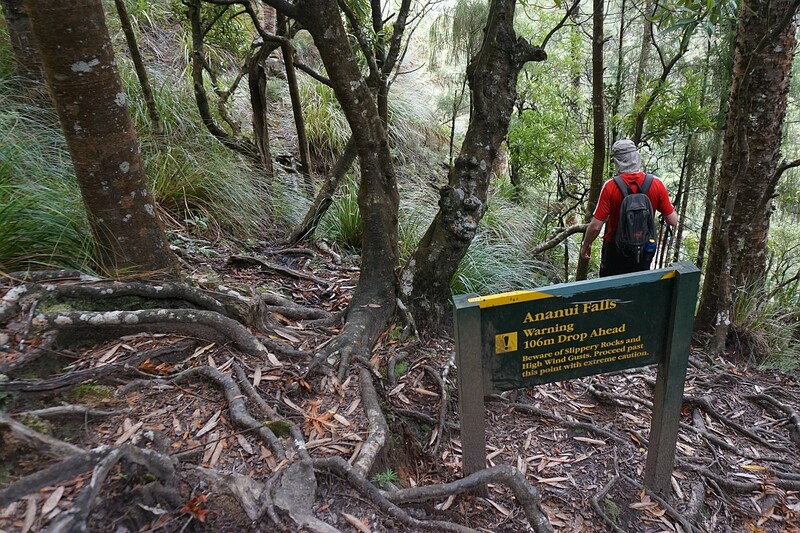 The Waitengaue Track to the Ananui Falls continues straight ahead after the crossing. 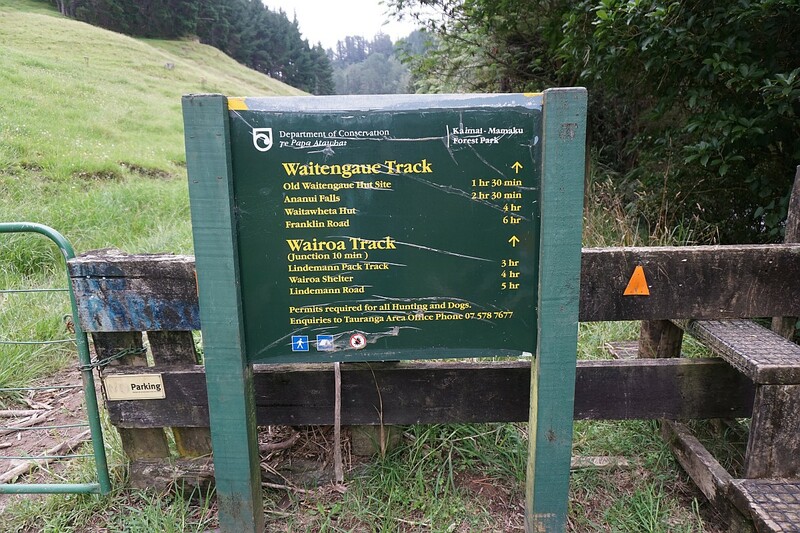 A first part of the track follows the Waitengaue Tramline, making for a gentle incline except where there have been washouts or the stream banks have eroded. 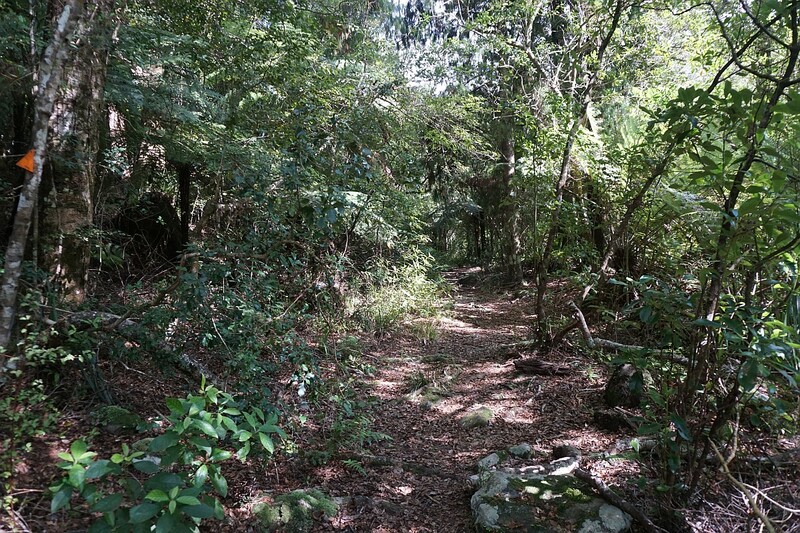 The initial part has only limited tree cover and, in places, bushes almost covering the track. 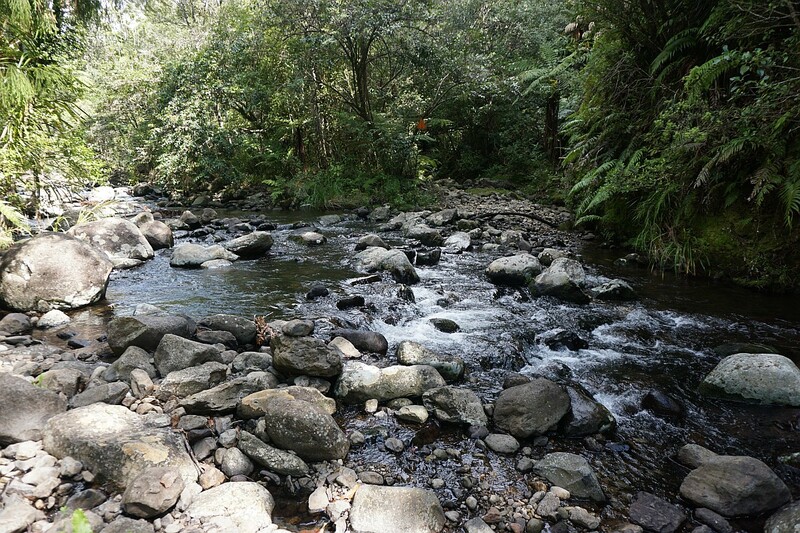 The Waitengaue Stream is crossed 5 times. After heavy rain the crossings would be difficult, but with the stream at this level it was possible to keep feet dry. The rocks in the stream are very slippery. 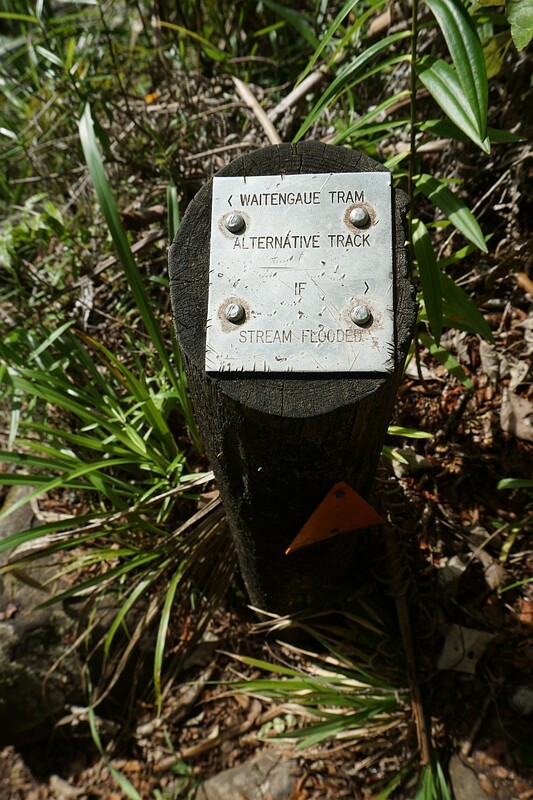 At the second crossing of the Waitengaue Stream there is a marker post for an alternative track that bypasses the two lower crossings when the stream is running high. The track was not visible, and apparently not recently used. Presumably it was more useful when there was a bridge across the Wairoa Stream, which could also be in flood, and for which there is no alternative route. The second crossing of the Waitengaue Stream, with the marker for alternative track at lower right. 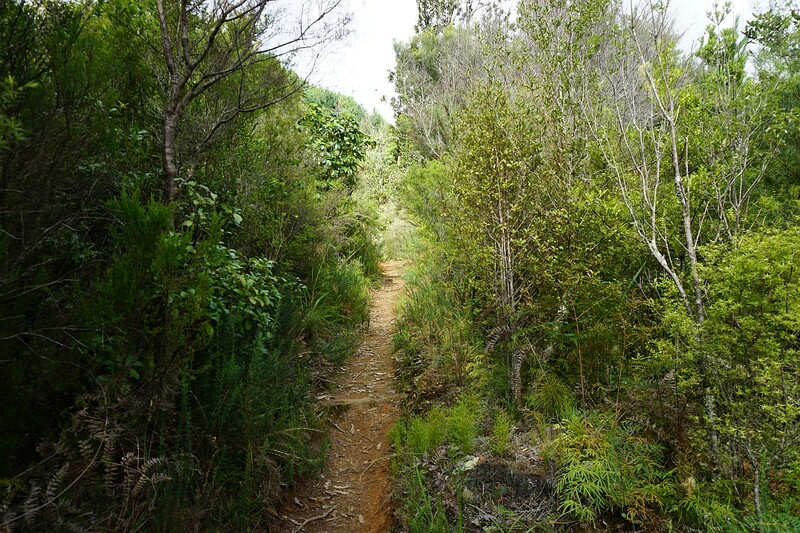 Regenerating native bush provides cover for the track as it follows the route of the Waitengaue Tramway alongside Waitengaue Stream. 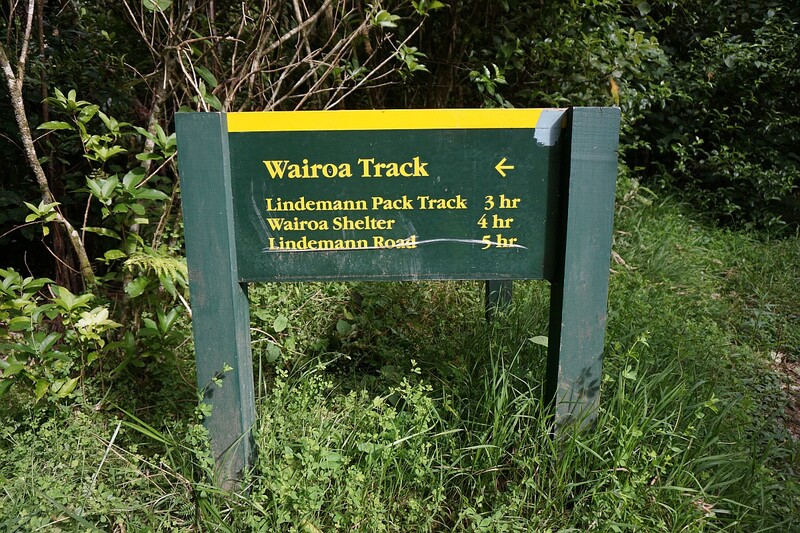 The track at the old Waitengaue Hut location. The hut clearing is on the left, with the track continuing on the right. 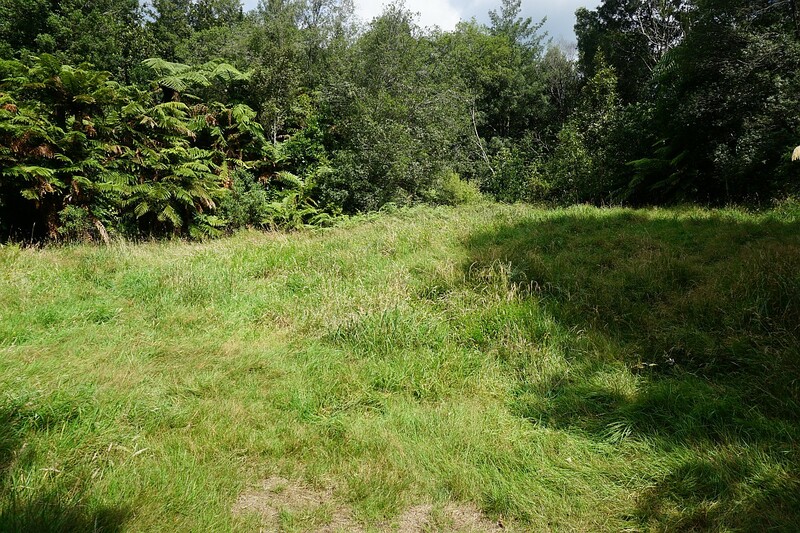 The clearing marks the location of the Waitengaue Hut. There are no remains from the hut itself. 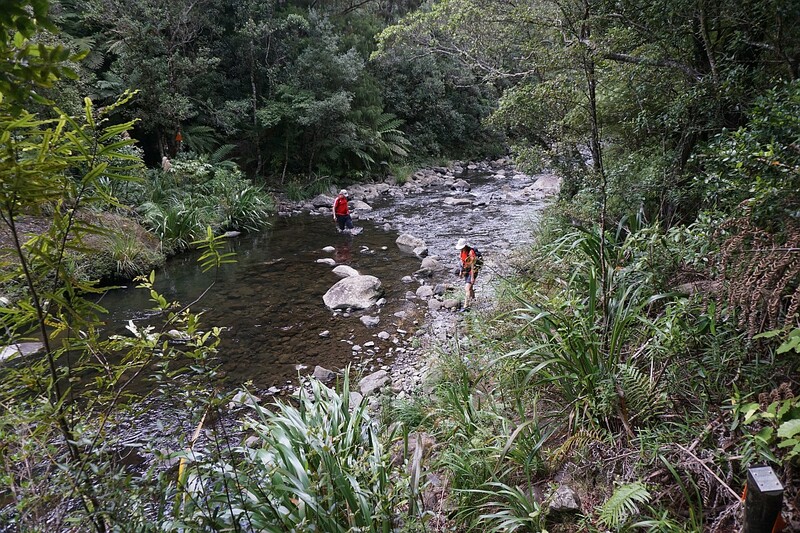 Another crossing of the Waitengaue Stream a short distance past the Waitengaue Hut clearing. 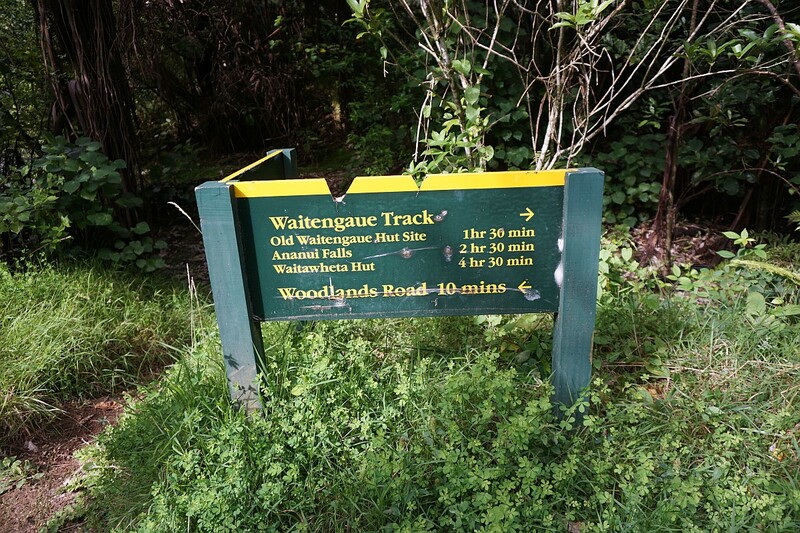 A sign marks the point where the track to the Lower Waitawheta Valley branches off from the track to the Ananui Falls. 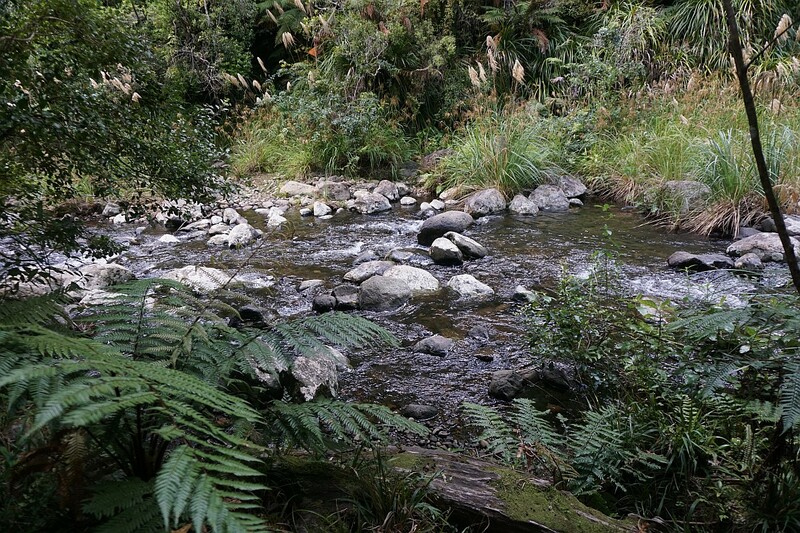 The Lower Waitawheta Valley Track starts off with a crossing of the Waitengaue Stream. Shortly after the track junction the track starts the steeper climb to the top of the falls. 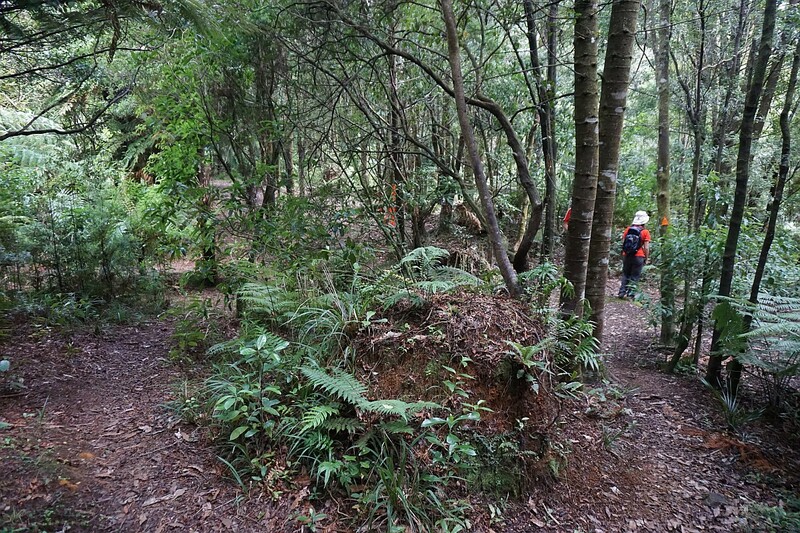 There are numerous younger kauri trees alongside the track. 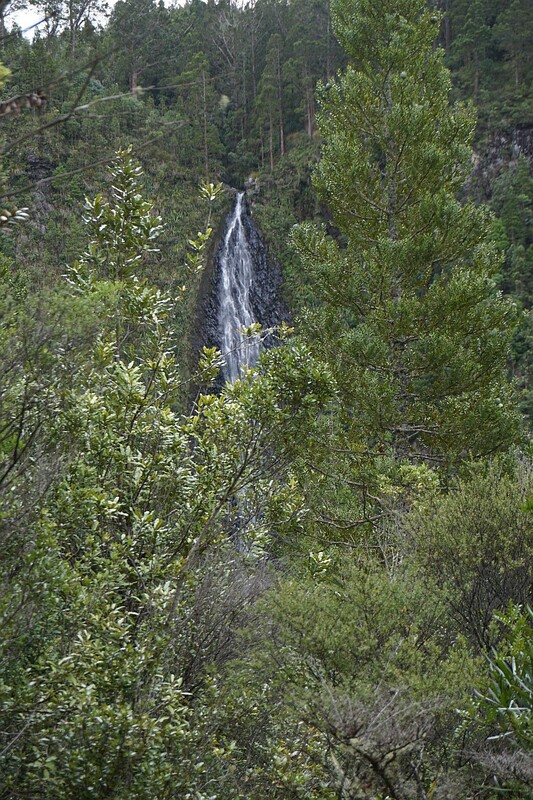 View from the only location along the track where the 106m high Ananui Falls are clearly visible. And then only through vegetation which covers part of the view. A detail from the previous photo, showing a couple enjoying lunch on a rock ledge at the very edge of the falls. 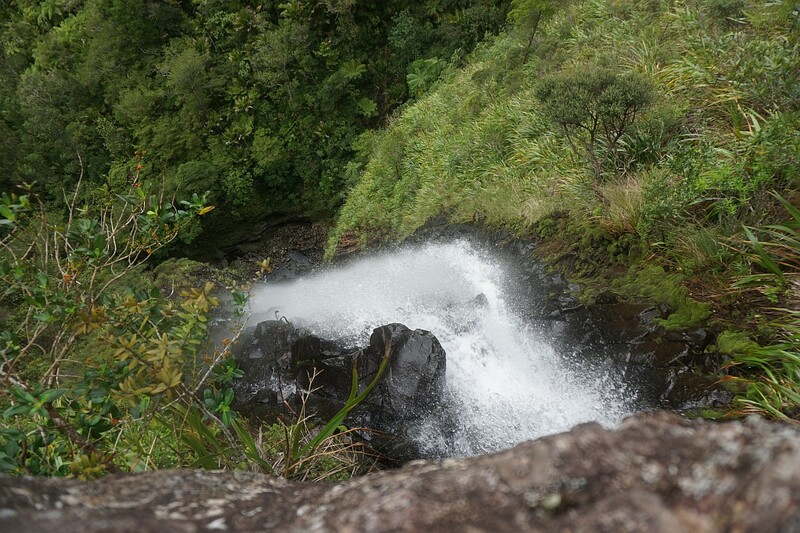 A short side track leads to the top of the Ananui Falls. 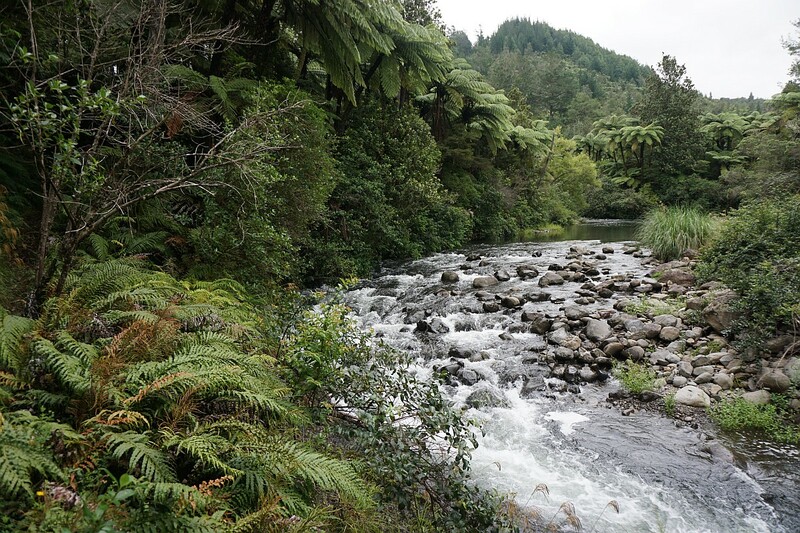 The side track to the top of the falls leads down to the Ananui Stream, which is crossed. 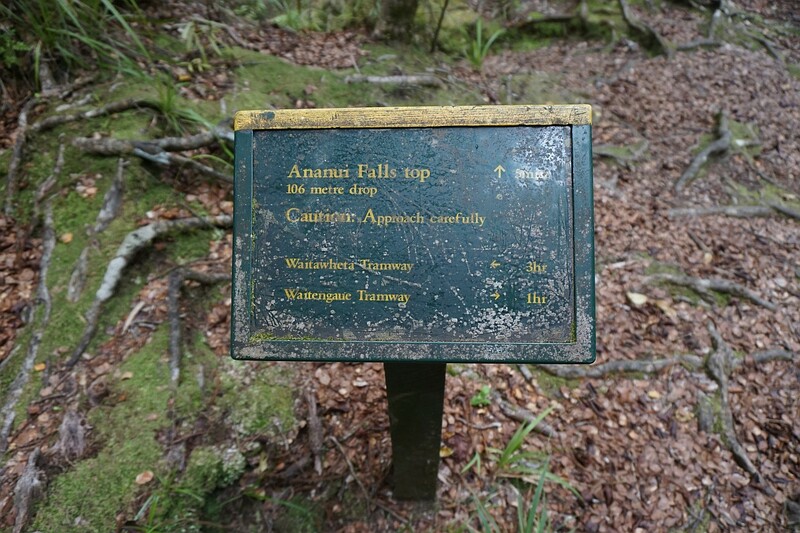 The warning sign approaching the top of the Ananui Falls. 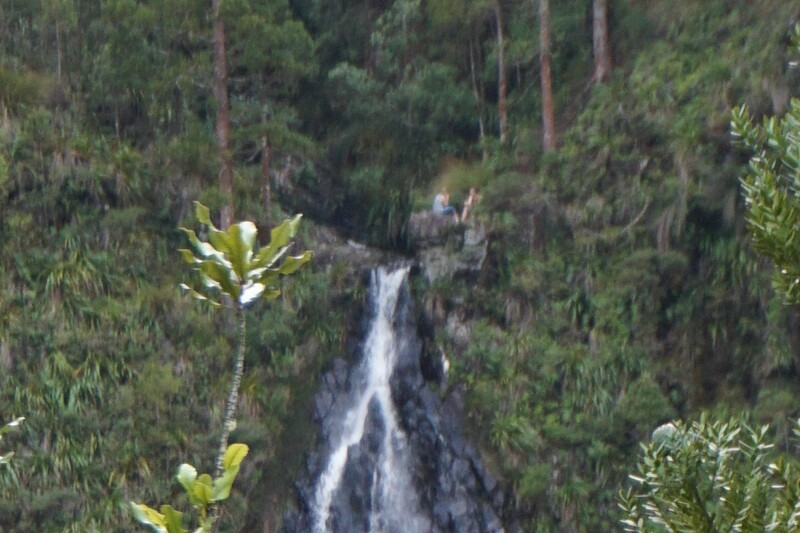 The couple on the rock ledge, by a 106m drop, at the top of the falls. 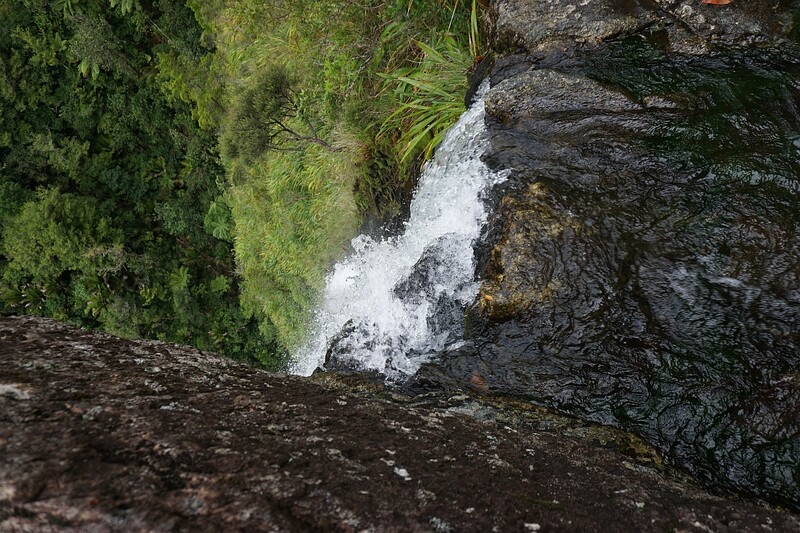 The Ananui Stream as it plunges over the edge. Looking down the waterfall from the rock ledge at the top of the falls. 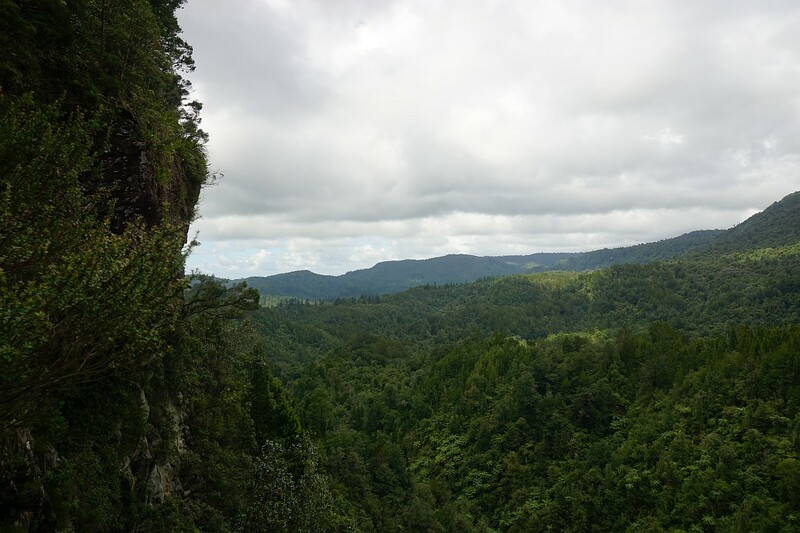 Views from the top of the Ananui Falls. The GPS tracklog shows the route used in both directions, as well as some locations of interest. 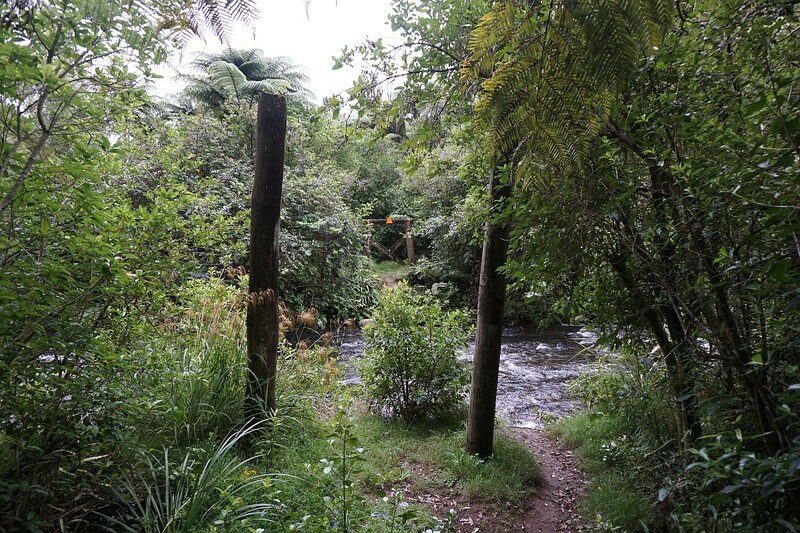 R marks the crossing of the Wairoa Stream and the 5 crossings of the Waitengaue Stream. 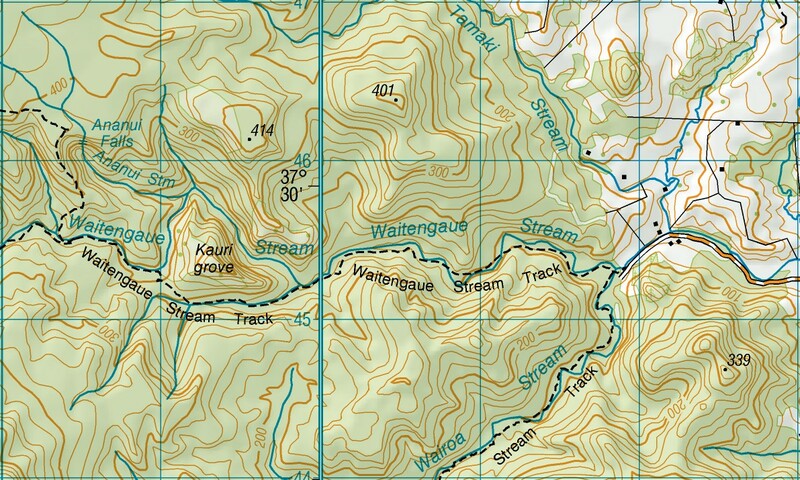 There are several crossings of a tributary to the Waitengaue Stream, but these are not marked on the map. Total, including short break at top of falls: 12.1 km, 5 hours. 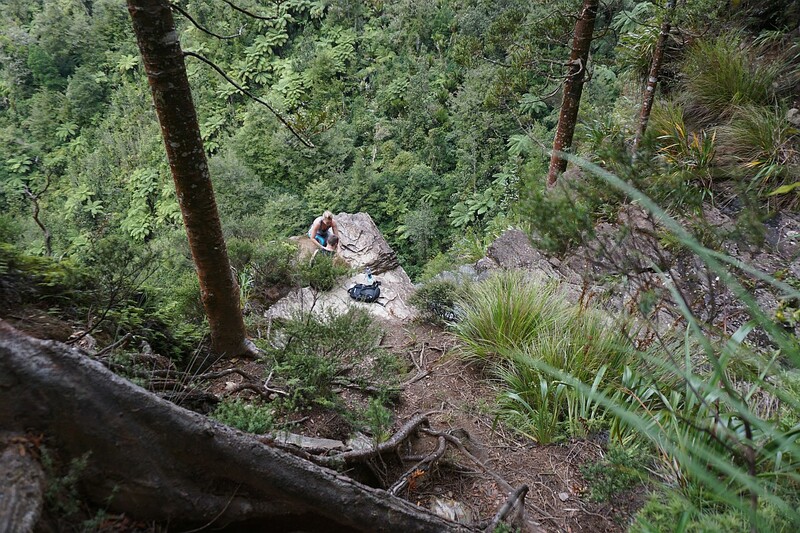 Woodland Rd to top of Ananui Falls: 6 km, 2 hours 35 minutes. Top of falls to Woodland Rd: 6 km, 2 hours 5 minutes. 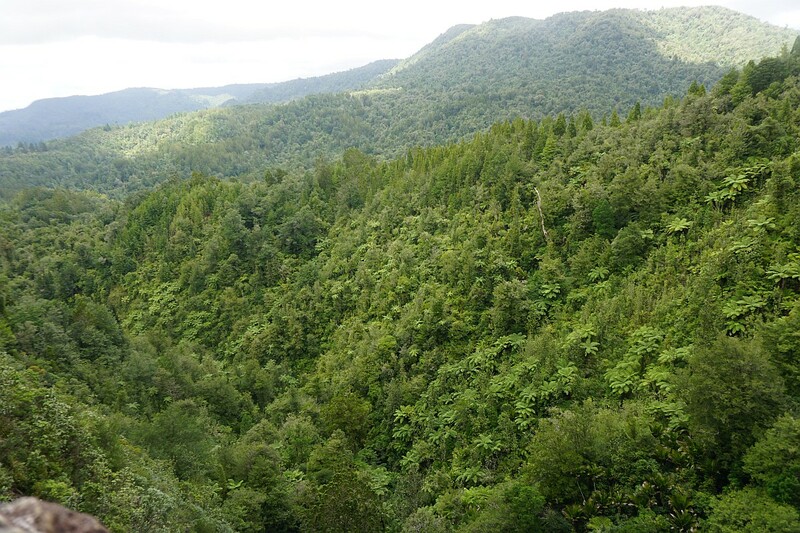 Woodland Rd to Upper Waitawheta Valley Track: 4.8 km, 2 hours. 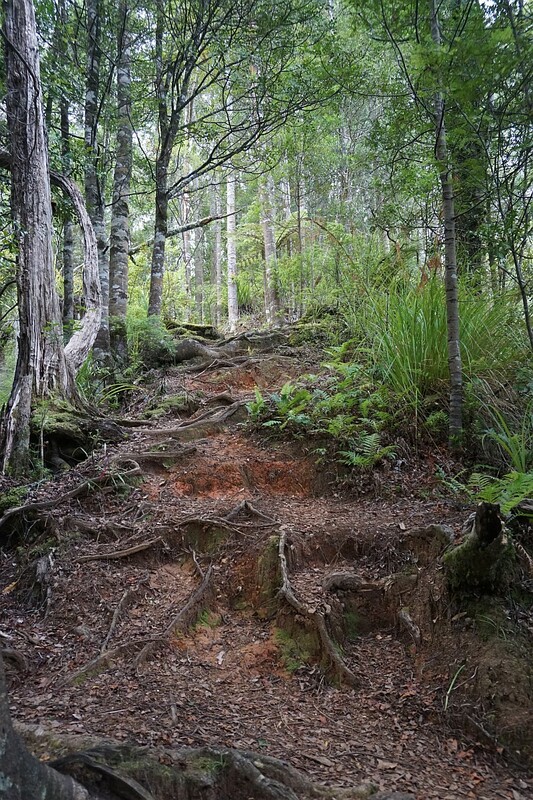 Junction of Upper Waitawheta Valley Track to top of falls: 1.2 km, 35 minutes. Lowest elevation at the parking area is about 70 m above sea level. Highest elevation near the top of the falls is about 390 m asl. The topographic map shows the terrain and the tracks, with Woodland Rd on the far right. The parking area is at the junction with Tamaki Stream. The track was walked on February 14, 2016.